Sometimes you may think of some little and simple in cooking and at the same time tasty snack to accompany a bottle of wine. So, my wife and I have recently discovered a snack of that kind called Camembert. It is a soft sort of cheese coated with cheese mold, which is especially tasty when it melts from the inside. It can be fried or baked. Both ways of cooking are simple enough, but during frying it’s much easier to monitor its condition. 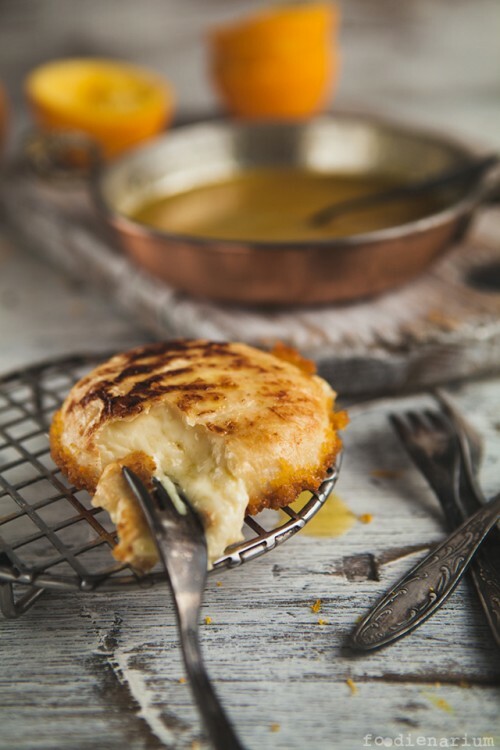 And you can fry it in batter, which adds zest to the taste as well as to the appearance of this wonderful cheese. At the same time I‘d like to show how to cook a simple orange sauce, which, by the way, can be used with different pancakes and other food for breakfast. The first step is to squeeze the juice. I had to squeeze 2.5 oranges for a full cup. Next, mix all ingredients in a small pot, bring to the boil and boil down to the half or until you get the desired thickness. It takes 15-20 minutes. Then filter the sauce through a sieve and let it cool. Voila, the sauce is ready. Half both rings of cheese. Dip the slice into the egg, so that future breading climbs slightly onto the sides. Then dip in crumbs well and repeat the procedure again. You need to bread well, so that the cut couldn’t be seen. Pour into the pan about half an inch of oil, heat and drop the cheese slices down. Fry until the golden brown color. Turn over and fry for a few minutes so that the cheese fries and swell, but doesn’t burst. The result is the cheese in a cool ‘skirt’. Pour the orange sauce and serve.